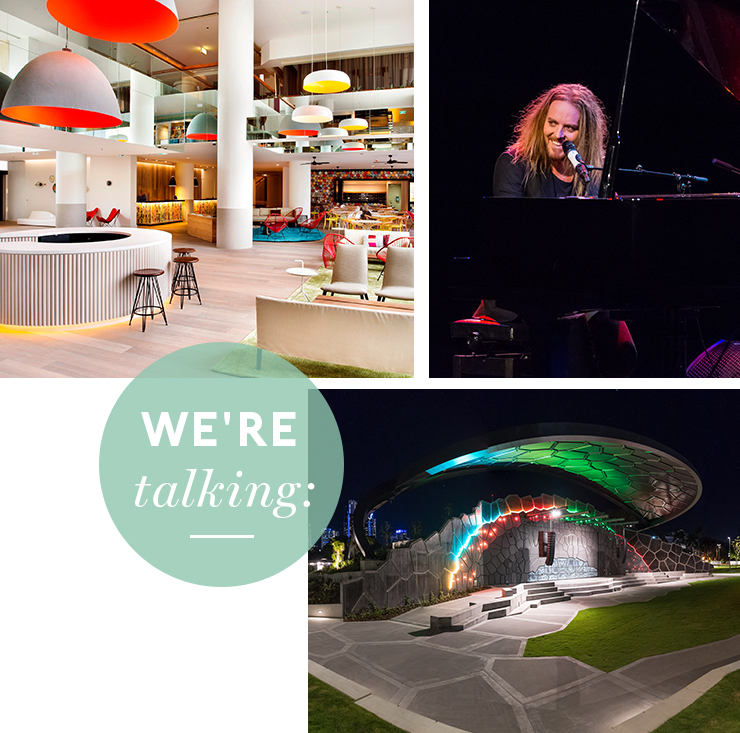 Get ready to reset everything you thought you knew about The Arts Centre Gold Coast, because it’s scored a seriously impressive facelift. And with a fresh face also comes with a fresh new name: introducing Home of the Arts, or HOTA for short (pronounced like “hotter”, in case you were wondering). What’s the most epic thing about this makeover? We’re so glad you asked. HOTA now includes a huuuge new outdoor stage that’s been two years in the making (hello, amazing space for gigs, concerts, events and more! ), flanked by a giant, colourful mural courtesy of New York street artist MOMO, which was commissioned to celebrate their super-exciting new chapter. And guys, this is just stage one. In mid-2018, construction will begin on a green bridge across to Chevron Island, followed in 2019 by the construction of Australia’s largest regional art gallery #nobiggie. What’s more is this place is comin’ in HOTA (sorry) with a killer new program to boot (check it out here). Staying true to its new incarnation by making a home on the Gold Coast for allll the big names in the arts (in an even bigger way), in 2018 HOTA will hit the perfect blend of showcasing international hotshots and emerging local talent, both of which we’re so down for. This new hub celebrates everything we heart about the GC (AKA the cultural diversity, the sense of entertainment and excitement, and of course A-class beaches), even bringing community festivities to life, like yoga, dances, fun runs and markets. As if this isn’t exciting enough (yep, we’re frothing over here as well! ), HOTA is diving straight into the deep end with the announcement that legendary showman, Tim Minchin, will be kicking things off with a concert on March 17—which has already sold out. To give you all a lil’ taste of what’s to come, you can also expect beats from music royalty Neil Finn, the Queensland Symphony Orchestra and even Laurie Anderson who’s taking up residency at HOTA (just to name a few). So yeah, this is kind of a REALLY big deal. To celebrate HOTA’s new era, we’re giving away an incredible experience that lets you get amongst all the newness! To enter, just drop your deets below! Terms + conditions can be found here. Editor's note: this article was produced in partnership with HOTA. For more information on our editorial policy, click here.